Bushrod Washington lived in the shadow of his uncle, George Washington, and never quite distanced himself from his uncle's influence. Bushrod surely acheived a measure of prominence if not distinction, reaching the nation's highest court as its eleventh justice. But Bushrod Washington was never in the same league as George. A "short, untidy man who liked snuff and suffered from ill health," Washington was born on June 5, 1762, in Westmoreland County, Virginia. Studious in his youth, Bushrod Washington began to hobnob with the famous thinkers of his time while at the College of William and Mary, from which he graduated at age sixteen. There he shared classes with future Chief Justice John Marshall. Bushrod Washington's books and quill pens were soon replaced by rifles and ammunition when he joined the army towards the end of the Revolutionary War. After the British waved the white flag and his soldiering days were over, Uncle George sponsored Bushrod as a law apprentice. 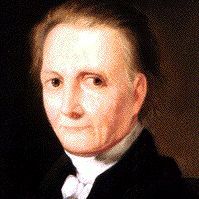 An interest in politics led Bushrod to the Virginia House of Delegates in 1787 and also to the Virginia ratifying convention for the Constitution. However, the thrill of the campaign trail faded fast, and he returned to private law practice and teaching in 1790. Such activities were his passions, and he may have never entered the national political scene again if not for his uncle George, who strongly encouraged his nephew to run for the Virginia legislature in 1798. Bushrod reluctantly agreed. B. Washington's days as an elected state official were not to be. In the year of the would-be campaign, Supreme Court Justice James Wilson died creating a vacancy on the High Bench. Washington and Marshall were the two replacement candidates on President John Adams' short list of Federalist Virginians. When Marshall refused the position, B. Washington received the nod. He was only thirty six years old when he took the oath of office on February 4, 1799. Washington was not a distinguished justice. Pundits classify his performance as average to forgettable, and Washington's written opinions during his 30+ years on the bench were few and far between. Rather than speak out, Washington proved a loyal follower of the great Chief Justice, John Marshall. Washington disagreed with Marshall only three times during the years they shared on the bench. If anything, it was Bushrod's life outside the Court that caused the most excitement in his time. George Washington left his entire estate at Mount Vernon to his nephew, making his wishes known that the Mount Vernon slaves there were to be freed. Bushrod followed his uncle's instructions, but then he brought his own slaves to Mount Vernon, selling them on the block when money troubles arose. Bushrod Washington, who believed in African resettlement for blacks, was promptly attacked by abolitionists and others for not following his uncle's example. Bushrod Washington died as he had spent most of his adult life- working at the law, this time on circuit court duty in Philadelphia. His bereaved wife died just three days later while transporting his body for burial. Looking for more information about Bushrod Washington?